Before Wii and Nintendo's Game Cube and PS2 or 3 or whatever number they're on, there was something way more better in home video gaming. 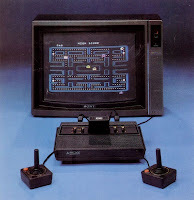 Making it's debut in 1977 along with the joysticks & paddles was the : ATARI. The following links are all related to that wonderful new game we once considered "the greatest thing since PONG." :: Here, retro – techy – nerdy meets fashion. :: If I HAD a cool, retro game room, these would look great! :: If you can’t see trading in your kids’ Wii for an old school Nintendo, you still have other options. :: What?! You have no Atari memories??!! Well then, try living vicariously through Kirk Demarais.